back in stock at this time. Thank you for your patience." I'm not sure what it means but hopefully there be back in stock soon! Okay guys so I have been obsessed with trying to find something new for my lips and so I remembered one of my friends telling me about Baby Lips by Maybeline. I looked it up and watched some review videos and now I'm actually mad because i don't have any yet so I suggest you check them out. And most people consider the pink punch one so if you're gonna get new makeup, I recommend you get these. look isn't too deep look like not too much eye shadow and stuff. -Lip stick (highly recommend the same lip stick color as your lips. 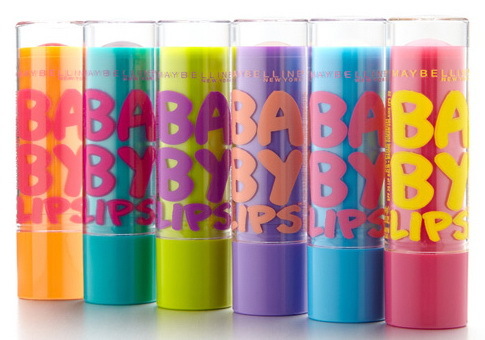 color like your natural lips. 3) Blush your cheekbones/cheeks with a light color. can always fill in your brows if you like! This week, I sampled a new nail trend known as Nail Polish Strips. This was my first time using them and I was very happy with the results. The color I used is I Love Lacey (shown below) and it looks excellent on my pale-ish skin and medium length nails. First off, these are super easy to apply. All you do is shape your nails, apply a base coat, and fit the nail to your size. You just stick it on and cut and file the extra sticker left over. I am very happy with the quality of these as well. Although they don't come cheap, my nails have not peeled or chipped and I have worn the manicure for a week now. They are very much worth the money for complicated designs like this. I hope everybody tries this new cool nail idea. Tell me how it looks either in the comments here or in the Toosh group Nail Ideas, which is ran by Thinzar. On the first day of school, you need perfect clothes, shoes, and maybe makeup, but most of all with the most attention, hairstyles. Here are some tips for you to get a cute hairstyle. This hairstyle is pretty hard but here are directions to it! **These directions were from cutegirlhairstyles.com. more times, each time adding the top strands to an alligator clip. 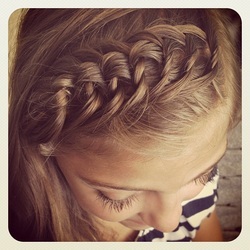 Repeat these steps until the braided headband has the look you want. Secure the end with a bobby pin and spritz with hairspray as desired. All credit goes to cutepolish. I saw this super easy nail design and instantly fell in love! I am totally going to try it. Here are some tips to make you more beautiful!